Star Wars: The Old Republic is celebrating its five year anniversary right now and has added some major changes. BioWare’s narrative heavy online experience keeps expanding. Last year, they began a large storyline that’s continuing forward in the new Knights of the Eternal Throne expansion. I sat down with producer Ben Irving to talk about the state of the game. Knights of the Eternal Throne tells the story of the player character and their battle against the massive empire of Zakuul. Assembling an army of allies from around the galaxy, the player must contend with the unhinged empress Vaylin as she lays waste to the galaxy. It’s a return to some of the storytelling that made Knights of the Old Republic so popular and shockingly well written for a story that’s nestled in an MMO that some people consider to be dying. The major gameplay addition of this expansion is ‘galactic command,” where players partake in a variety of activities to defend their control over the galaxy and gain influence in server-wide rankings and battles. It adds higher stakes to endgame content. The expansion’s added a new vitality to the game. Producer Ben Irving sat down with me to discuss exactly what goes into maintaining such a long running MMO. Heather Alexandra: You just released Knights of the Eternal Throne. It’s an interesting departure from the original game. How much of that was part of a long term plan? How does a BioWare story come about? Ben Irving: In many ways, you plan everything and then in many ways you have to change everything as you go. When our writers sat down to plan the story, they had the core beats worked out. They wanted to make a story that has more of an ending to it than the original class stories. That notion started several years back when talking about the idea of the most dangerous family in the galaxy. They had this idea for an arc with those characters and decided it might make sense to be told through expansions. Once the first expansion shipped, we started getting heavy feedback. The difference between [SWTOR’s first story expansion] Eternal Throne and Fallen Empire is really tied to the feedback. For instance, people told us that when they make choices in the story, they wanted to see them pay off in the longer term but also wanted them to have more immediate effects as well. We looked at that kind of feedback and made some pretty big changes to Eternal Throne. Heather: Does that feedback affect your gameplay decisions too? Ben: As the years go by, we’ve seen players play the game in a lot of different ways. Acknowledging that and trying to add different features based on that is a big part of running a live service. In Eternal Throne, we tried to add a lot. You can pilot a walker, go undercover as an enemy soldier. We wanted to add in things that made the game feel a bit more fresh. Heather: When SWTOR started, the setting was a bit derivative. You had the Republic and Sith Empire, which were based heavily on the films. You eventually added a whole new faction with Zakuul. What’s it like creating such a big piece of lore? Ben: When it came to designing a whole new empire, it was a really big challenge. With smaller decisions, like naming planets, that stuff is figured out a bit later but I think our writers were excited to do something new. We were planning Eternal Throne around the same time as The Force Awakens. It felt right to do something bigger because we felt the movie was do that too. It was certainly a lot of work. We even brought back old writers to help out. I think it paid off. Heather: You mention The Force Awakens. You started SWTOR in 2011. I remember playing the beta in college! You’d been around for a while and suddenly had to deal with the Disney acquisition later in the game’s life. How does something like that affect creativity? Are you free to go to town with things or is it a bit more limited? Ben: The acquisition didn’t make a huge difference to us. We’ve had the same Lucasfilm contact we’ve had for a while. We’d been working together so long that we knew where the boundaries were already. There’s also a lot of benefit to having our game be set three thousand years before the movies. We can do some pretty epic things without needing to worry about the fallout. We can have an all powerful emperor or create brand new worlds that don’t have to tie into the movies at all. The trick is to find the things that still make it feel like Star Wars. A small band of rebels against overwhelming odds is the story for most of the movies and that was the theme we focused on for our expansions. We can still hit the things we believe we so meaningful about the movies but also use this open spot in the timeline to do things that are a little different. If we were doing a Star Wars game set around the movies, we’d still have a lot of opportunity. I think Rogue One is an example of that. I think it can work either way but we definitely feel the earlier setting gives us a lot of freedom. Heather: I suppose that gives you freedom for what you want to do with the player too. You end up giving them a lot of power in this new expansion. Ben: There’s two important things to keep in mind. You want to keep in mind what is happening in the story but you also want to keep in mind what happens when players finish it. I remember [creative director] Charles Boyd saying “What if we let players rule the galaxy?” You can’t do that if you’re set in the original film timeline. That was a case of our setting giving us a chance to try something a bit different for a Star Wars game. But you have to ask: What happens next? That’s what we hope to look at as the story continues. Uprisings are a part of that. Once you earn your throne, you have to defend it. So we turned some of that into endgame content. We’ll have to wait a few months to see that get expanded upon further. Heather: I was wondering if it gets hard to manage to loose ends. The main stories have a ton of characters and plot points. My friend, for instance, wants to see [Sith Warrior companion character] Malavai Quinn return. How do you choose what to bring back? Ben: We struggle with that every day of our lives. I’d love to see Malavai come back because I’d like to murder him for some of the things he did in my story. It’s hard. People ask us about the original companion characters very often. One of the hardest things about working on video games is that you always want to do more. We know how quickly players can get through content. As a designer, you have a giant list of things you want to do and you’re never able to get it all done. That’s just the reality. Which means we’re always going to have loose ends and characters. The further we go into the game, there’s so many things that could have happened in a player’s story. We try to ask what are the most impactful and meaningful things we can do for the players. That filter helps narrow things down but it’s hard because you’re always going to disappoint someone because something falls through the cracks. We just try to do our best and move forward but it definitely is a difficult process. Heather: Is there anything that you and your team really wanted to do but just could not manage to get done? Ben: From my experience, you always want to do more. I don’t know if there’s anything specific that we failed to do because those are the things we try to prioritize. For this year, we wanted to tell a story that wrapped up many of the stories we’d previously begun. We got that done. The second challenge was getting people engaged in the long term. We settled on the Galactic Command system, which lets players make large scale decisions for the entire galaxy. Within that system, are there a few things we want to add? Of course. But I think mostly accomplished what we wanted. Heather: There must have been some smaller things that you’d been pushing towards for a while though. Ben: Charles wanted to have players drive a walker for a long time. That was a big dream of his. He finally got to implement that after nearly five years. He was leaving hints about that back in the Trooper story at launch but we just didn’t have the tech to do it. I know that was a big deal for him and it made him very happy. Heather: I remember back when the game was coming out, people on the forums always speculated about if the devs were light side or dark side fans. What about you? Are you an evil emperor or a good dude? Ben: I’m both! When we play internally, I’m light side. That’s how I tend to play most games. I like to be the good guy. On the live server? My main character is a Sith Warrior and he’s definitely not light side. I’ve been upset with some of the characters in the story and their betrayals, so I’ve taken a slightly darker path. Heather: Do you have any parting words for the fans? 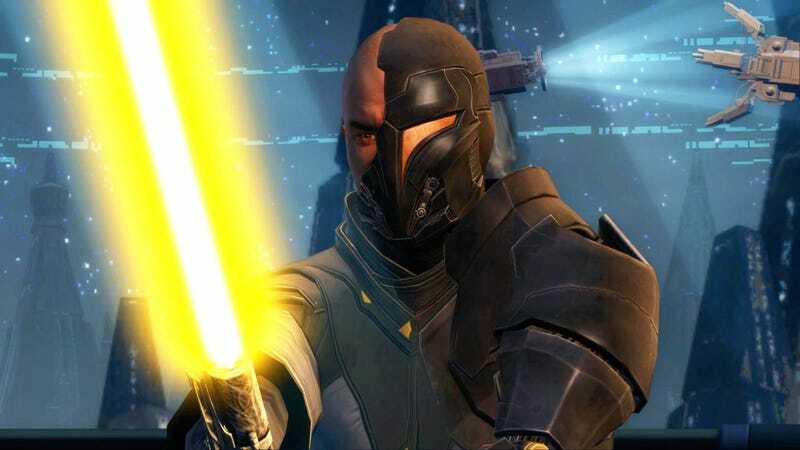 Five years is a long time to keep a game like The Old Republic alive. Ben: For us, we’re excited to be in such a good place after five years. It’s hard for online games to continue to be relevant in such a tough environment. I just want to take a moment to thank our players for their passion. It sometimes makes our lives a bit tougher but ultimately makes for a better game. There’s so much great Star Wars hype out in the world right now. I hope people come back to the game and enjoy the story. But mostly: thank you all.